Have you ever wondered what it would be like if you’re allergic to several food groups, on an already limited diet, and for health reasons you’re told you have to cut even more food out? It happened to me in August 2018. When I’m not working or writing about being allergic to everything, I’m singing. I sing in four choirs, with rehearsals up to four times a week. I also sing in pubs as part of a pop duo and as a solo act. So I need my voice. Around two years ago I started to experience problems with my voice. My voice was becoming strained and tired very easily and I would often lose it for no apparent reason. I then started to experience a sore throat. It would feel raw, like razor blades. When I lost my voice just before a big concert I decided enough was enough and I would see my doctor. My doctor referred me to the ENT department at my local hospital, but when I hadn’t had an appointment for several weeks I called to find out there was an 8-1 week waiting list. With more concerts and cathedral visits coming up I couldn’t wait this long, so I booked an appointment with a private consultant. He talked through my symptoms and my eating habits then did a laryngoscopy, which is a camera that gets passed up your nostril and down the back of your throat. The camera showed that I had a very red larynx, which was a sign of silent acid reflux. It’s called ‘silent’ because there are no symptoms apart from a sore throat or strained voice. Thankfully there was nothing wrong with my vocal folds, but the acid reflux was causing my muscles in my throat to tense, which was causing a mid-glottal gap. When you use your voice, your vocal folds adduct and vibrate to produce sound. The thicker the folds on addiction, the lower the sound; the thinner the folds and the fast the vibration, the higher the sound. Because the tension was pulling at my vocal folds, they weren’t addicting correctly allowing air to get through and producing the strained voice. The gap also meant I was having to work harder to produce a sound, which was tiring in itself. The consultant put me on a restricted diet for a month, in a bid to blitz the reflux problem and to get my throat back to a better condition. This meant no caffeine (or decaffeinated drinks), as caffeine is drying, no fizzy drinks and no wine (gulp). I also had to cut out/cut down on spicy foods, tomato based foods, peppers and raw red onion. Taking into account my allergies, this is pretty much everything I eat. I also had to cut down my portion size and eat small amounts of food more regularly. That part was easy; I switched to a side plate for my main meals, which means I can’t be tempted to over-eat as I can’t fit any more food on the plate. With the exception of wine, drinks were fairly easy to change. I switched to red bush (rooibos) tea, which can be drunk with or without milk. It is completely caffeine free, has a pleasant taste and is available in the big supermarkets and some cafes. I completely cut out fizzy drinks, but do find I get the odd craving for a cold bottle of Pepsi Max every now and then. I drink a lot more water. I try to have a glass when I wake up and I carry a folding bottle wherever I go. I did cut out alcohol for the best part of a month, only allowing myself some at a music festival. Whenever I have a big concert or solo coming up I’ll avoid alcohol in the week leading up to it. I drink water in between glasses of wine, and I’ve reduced the amount I drink in one day. The question of what to eat is much harder. Most of our meals are tomato or chilli based as these contain no dairy or eggs. My salads always have sliced raw onion in them. And peppers feature in most of our recipes. Tricky. The first thing I did was go back to the millions of recipe books in my cupboard and look for recipes that we’ve made before and forgotten about. And there were lots of them. My favourite at the moment is a chicken, ham and broad bean risotto made with ham stock that we made ourselves. I’d forgotten how tasty it could be. The next thing was to look at the tomato/chill/pepper based recipes to see what could be amended to meet the new diet. It was relatively easy to reduce the spiciness of otherwise spicy dishes using dried chilli flakes. I would just use fewer on my plate and Mr Allergy could add more. Simple. Cutting out tomato is virtually impossible. Nearly everything has chopped tomatoes in it. So instead of cutting it out completely we reduced the number of times we eat tomato based foods in a week and tried not to have too many in a row. This meant having salads (without red onion) or tray bakes. If I’m cooking ratatouille, I’ll leave the tomatoes out of my portion and just have the veg. I’ve found we’re becoming much more creative with the use of herbs and spices now that tomatoes and chilli are mostly out of the equation. I’m also not completely avoiding peppers, but as with tomato I limit the quantity and regularity. An added complication is that I have to take protein pump inhibitors (PPIs) 30 minutes to an hour before I eat, which is tricky. In the morning the alarm goes off at 5:20am. I usually roll out of bed around 5:45am when I realise that my train is not going to be cancelled and I do have to go to London. I make it downstairs by about 6am, take my PPI, make my breakfast, eat my breakfast and run out the door at 6:20am to get the 6:35am train. When I get home at about 6pm on a Monday I have to dive in the shower, wolf down my dinner and run out to choir practice. Most days have something similar. So I’m usually taking my PPI just before I eat, meaning it’s not particularly effective. I also have to take Gaviscon Advance after every meal, which is easy when I’m at home and in the office. But where you’re out with company for dinner or at a conference for work, it’s embarrassing and inconvenient. And the bottles are huge and heavy to carry, meaning I can’t take a nice handbag as it won’t fit. Sometimes I’ll slip off to the loo to take it. If I’m with people I know well I’ll make a joke of it and have a swig from the bottle. But it’s a pain, and one I could do without. I still have the odd problem. Eating out is particularly difficult. For example I went to a meal with friends at Zizzi. Before I went I’d planned what I was going to have; spiedini pollo. When I got there, Zizzi had other ideas as the spiedini pollo I usually had was no longer on the menu and had been replaced with one that I was now allergic to. In a panic too order something that wouldn’t kill me, I went with the rustica piccante pizza with dairy free mozzarella, which unfortunately contains tomato and lots of chilli and is huge! It was delicious, but far too spicy and there was far too much of it, and I should have stopped there. But there was dessert on the menu that I wasn’t allergic to, and my mantra is that if there is something on the menu that I can eat, I’ll have it. So I did. And I regretted it. My throat was sore and my voice was terrible for over a week. I spoke to my voice therapist about it and she said that if I wanted to heal my voice I would need to be disciplined about my food. Which would be fine if I had a choice of what I can and can’t eat. But when I’m in a situation like Zizzi where the only thing on the the menu is something that contains tomato, chilli and peppers, what do I do? Not eat? Or do I just not go out to eat, so I can always prepare my own food. How miserable and boring would life be? What I’ve taken away from this experience is that if something contains chilli, I should probably ask for no chilli or fewer chillis to limit the heat. If the dish contains tomatoes, don’t eat tomatoes the next day. If the dish served to me is enough to feed a small third world country – you know where I’m going with this. I just have to be sensible. Sometimes I’m going to slip up. Last Saturday we went to our local Italian restaurant for Mr Allergy’s birthday and I ate more in three courses than I’d eaten over the previous seven days. But I didn’t have the spaghetti bolognese, instead I had the daily special calves liver and bacon, which was delicious and is something I wouldn’t cook at home so it made a real change. I had melon and prosciutto for starter (nothing bad there). And I shared dessert with my friend. Acid reflux symptoms can ease over time, and I think I’m getting to that stage. However I do still need to manage my diet to stop it getting back to how it was, which is hard and upsetting at times. Singing means so much to me, so I know I need to look after my voice, but the added complication of my allergies does compound the situation. But at least I now have the tools in my toolbox to manage the problem to the best of my ability. 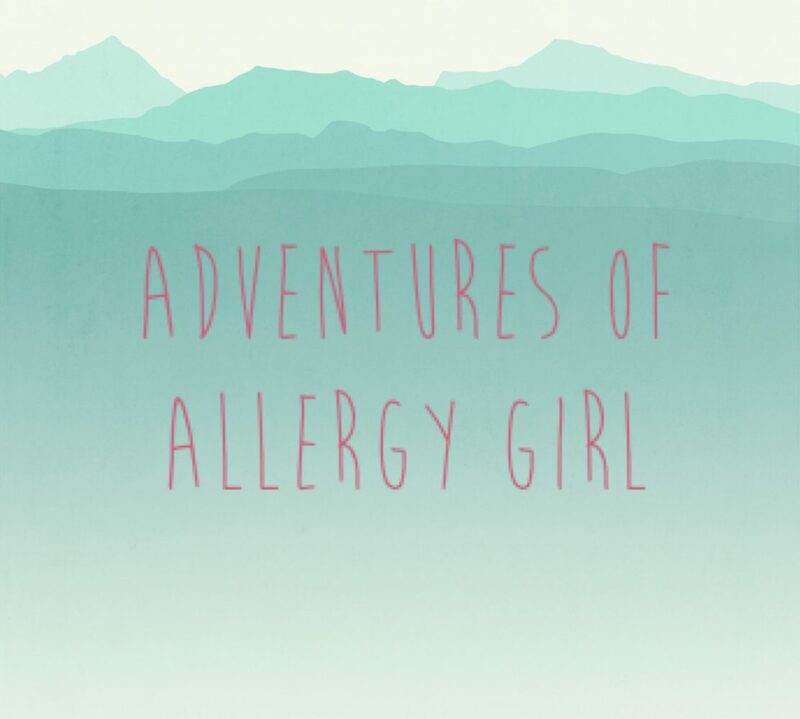 I’d be interested to hear from anyone else that has allergies and a restricted diet for health reasons, and how you manage it, so please leave me a comment.